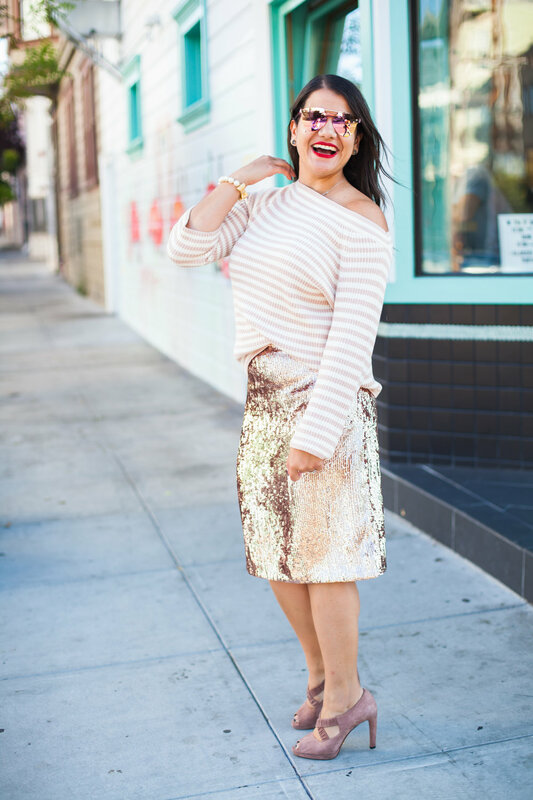 I don't shy away from intense outfits -we know that- but I heard you loud and clear, you challenged me to see how versatile my closet really is, so here we go: 1 skirt, 3 ways. And because I'm starting out with a bang, let's do DAYTIME SEQUINS. A little bit of shoulder, sassy red lips and a comfy knit. I call this the sparkler. I have a corporate job, I wore sequins to the office. Am I cool yet? Maybe, because I added camo. And, denim jackets are the best way to tone down the sequins glow. Also, remember my story with the monogrammed items? Well, I look put together because of that. Daytime sequins, take three: girlfriends lunch. The slouchy tee and the flats make the outfit more casual and perfect to hang out with your girls, here I was eating at Media Noche SF with the lovely Christine and being mildly rude checking my phone.